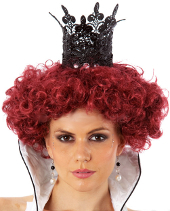 Inspired by Alice in Wonderland, this high quality Queen of hearts wig is red and curly. Off with her head!!' Sound familiar? It's the Queen of Hearts of course. This Red Queen of Hearts Wig is perfect for those who have an upcoming Alice in Wonderland party or royal themed fancy dress. Super soft and silky feeling, you won't want to take it off!